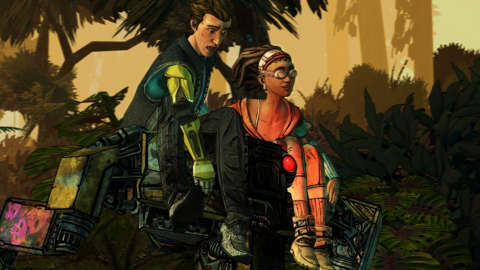 Tales from the Borderlands' third episode, Catch a Ride, is its best yet. Its cold open--a frantic action sequence that kicks off seconds after the previous episode's ending--sets the bar for drama high and never falls from it during its two-hour run. The best thing about Episode Three is that it is essentially two vastly different games. The final choice you made in Episode Two, Atlas Mugged, has a profound effect on what happens throughout the entirety of Episode Three. Your narrative path is determined by a decision made in desperation as all enemies closed in on Fiona and Rhys in Atlas Mugged's last minute, and that choice will set you on a path that follows either Fiona or Rhys more closely. Other characters caught in the crossfire will undergo significantly different changes as well--it's hard to discuss this without spoilers, so pardon the vague terms--which in turn also affect just how screwed you are as you go about your mission. After making your last decision in Episode Two, you can play through the entirety of Episode Three without seeing half of what the episode has to offer. So if you want to see both narrative paths and experience every possible outcome, you'll have to play the episode twice following two distinctly different decisions. It's a little confusing, and a lot of time to invest, but it's time well spent; Catch a Ride's two versions offer their own memorable moments and bits of hilarity, so it's worth the second playthrough. Catch a Ride calls back to previous episodes in meaningful ways, deepening the story and giving players headspace for some serious theory crafting. Remember Felix, Fiona and Sasha's wheeling and dealing adopted father? His story comes into play in a big way in Episode Three, turning everything the two girls thought they knew upside down and making their trials in Vault hunting more emotional than physical. As the sisters struggle to come to terms with this new information and babysit the boys (because let's be honest, they are in charge here), Rhys is grappling with his own ever-growing problem--the literal voice is his head. Again, depending on your choices, the ghost of Handsome Jack is either chomping at the bit for more control of Rhys' body or has completely convinced the guy to trust his guidance. Both of these tracks present some incredibly tense scenes between the two, and the growing idea of Jack's ghost as a legit threat adds more anxiety to an already thrilling narrative. 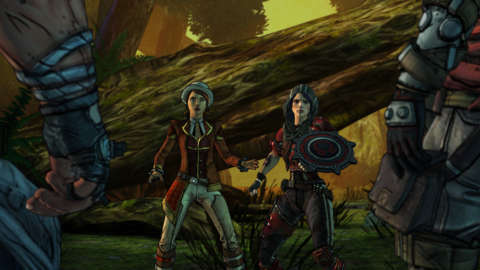 This isn't the first time Telltale's versatility in presenting varied narrative options has really shone through in Tales from the Borderlands, but it is perhaps the ultimate example of what they can do. Tales' branching story fully handed you the reigns for Episode One, and the challenge back then was maintaining that surrender to players for four more episodes. Episode Three is a strong example of how much control you actually have on this story, which is a lot; it's surprising and delightful to navigate certain social situations and be reminded that this is, at the end of the day, your story. Fiona and Rhys may misremember or exaggerate what happened, but it's you who gets to decide what is truth. And when the credits roll, going back to try the episode again with different choices results is such a different entertaining experience, it's hard not to want things both ways. Narrative variety aside, notable elements of Episode Three include the addition of new characters and expanding roles of existing ones. Vault Hunter Athena steps into a much larger role, and her presence feels completely natural among Telltale's new heroes. My favorite moment in the episode is a conversation between her and Fiona about what it means to be a Vault Hunter, with Fiona doubting her own abilities and Athena insisting it's not about power--it's about being able to think on your feet. This brief moment of real talk is a humanizing moment for Athena and a wake-up call for Fiona. It's the sweetest moment in the series so far, and one that reaches out to not just Fiona, but you as the player and consumer of the Borderlands universe. Ashley Johnson's character also makes her debut in Catch a Ride as what is perhaps the world's cutest robot. Her performance is astounding, adding another layer to the headache Rhys and Fiona are dealing with and another mouth to spout hilarious dialogue. Johnson's character has the best one-liners of the episode, and I definitely snort-laughed a few times during her scenes. Tales of the Borderlands shines in the little things, its moment-to-moment drama and humor consistently on point. Every exploration sequence is populated with curiosities to examine and conversations that shape the world in big ways. Action sequences move quickly and keep your heart pounding; like in the original Borderlands games, you need to catch up and run with the big boys or die gruesomely. Each second spent in its world teaches you something about the characters you're shepherding and the Borderlands universe at large. Episode Three is definitely the best we've seen of this series so far.